Thank you Organic Girl for sponsoring this post. 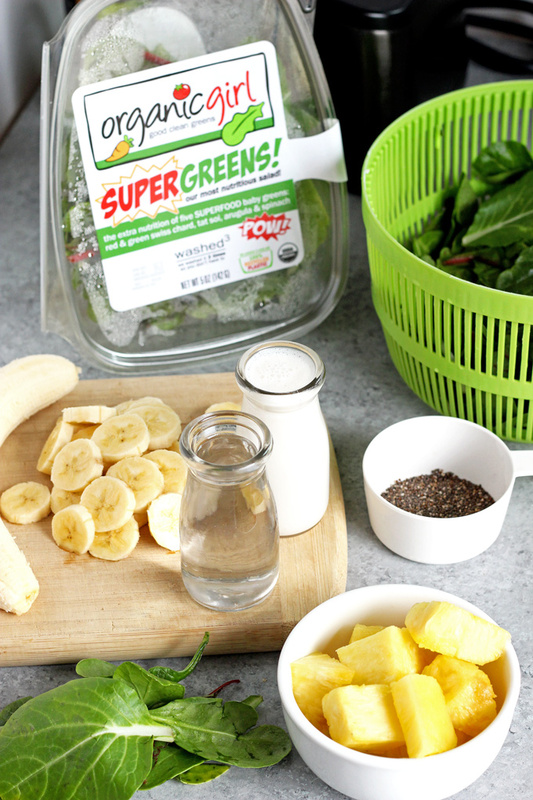 Click here to get Super Greens! Smoothies are a great way to nourish your body and provide essential vitamins and minerals. 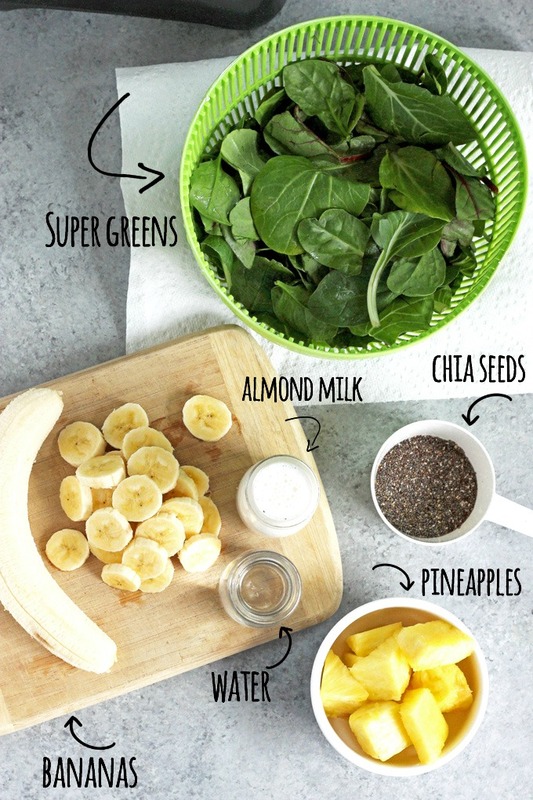 This Super Green Cleansing Smoothie is a win win win to kick off 2017! The holidays are coming to a close, the new year is literally a few days away. I feel it’s important to keep your health on the forefront of your mind at this time. Well at all times but especially during this time when we have fresh opportunities for new beginnings and to start over. We all slack during the holidays, we ( I ) eat way more cake than we should, cookies are the enemy, and there’s no such thing as portion control. And why should there be really. Do we have to be drill sergeants 24/7 with what we are putting into our mouths, obsessing over and over on every single thing we do? No I don’t believe that’s healthy. 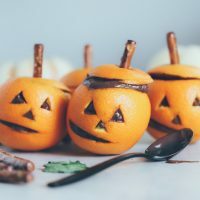 I feel as long as you take care of yourself for the most part, it’s ok to have those times where you’re not paying as close attention and beating yourself up about the sugar you consumed for Christmas. It’s not like you are doing it year round. If so, then it’s an issue and taking your health seriously is important. When I’m drinking smoothies daily and making sure I’m getting in a good amount of solid nutrition I don’t feel bad when I do eat that piece of cake or some of those cookies. It’s called balancing. It’s an act really because balance doesn’t come easily everyday. Everyday we have to practice the art of balance in all aspects of our lives not just eating and exercising but in relationships, career, and socially too. Now here’s the reason why I call it Super Greens! 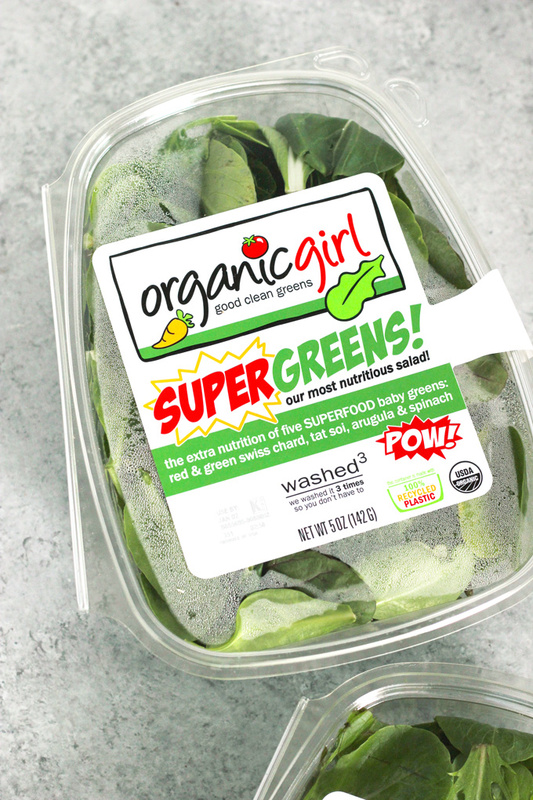 Organic Girl Super Greens is their most nutritious salad blend. 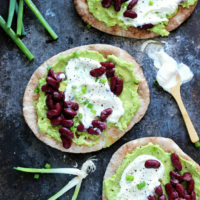 These pack nutrition superstars and it tastes great! They are all powerful dark leafy superfood baby greens packed with minerals, vitamins, phytochemicals and protective compounds. This is a blend of 5 different greens: tangy red & green chard, hearty bok choy, and spicy arugula accented with mild sweet spinach. If you’ve been following me for a while you know Organic Girl is my go to for premium quality produce. They’re fresh, clean, and passionately picky, and are 100% recyclable. They are a very resourceful, honest company and I’ve been affiliated with them for a long time now. I’m a loyal costumer. They care about their customers hence why they are so transparent when it comes to their produce. It seriously bugs me when I go out to eat and I’m getting charged 10 bucks for a gmo salad. I rather save my $$$ and buy real food that I know will actually keep my body healthy. 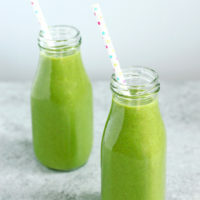 This smoothie is perfect because as we head into the new year as I mentioned this will aid in cleaning out your system. Pineapples are great for removing parasites, chia seeds pump you up with omega-3’s, greens are life, bananas are super high in potassium and helps lower blood pressure, water is great for flushing out toxins, and almond milk is high in proteins, lipids and fiber. See the balance in this smoothie?! It’s basically genius. You can also use coconut water! Great for those much needed electrolytes especially after a workout. 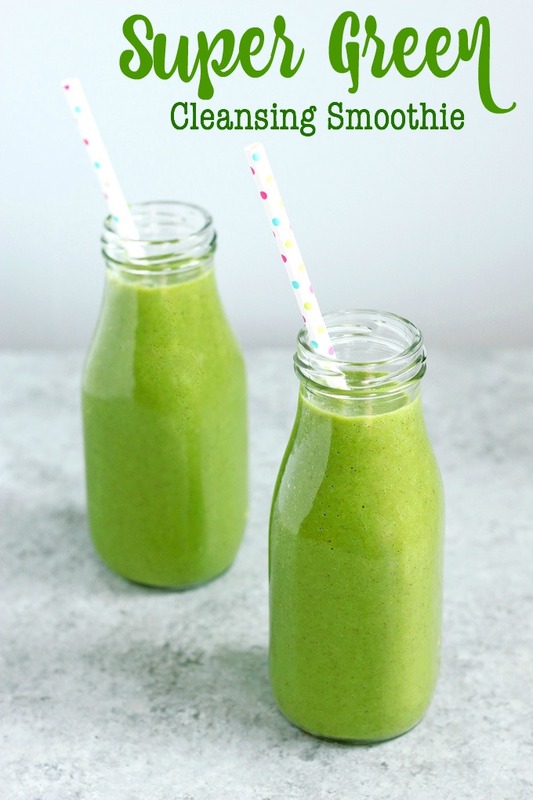 Super Green Cleansing Smoothie - An easy way to nourish your body and provide yourself with essential vitamins and minerals. 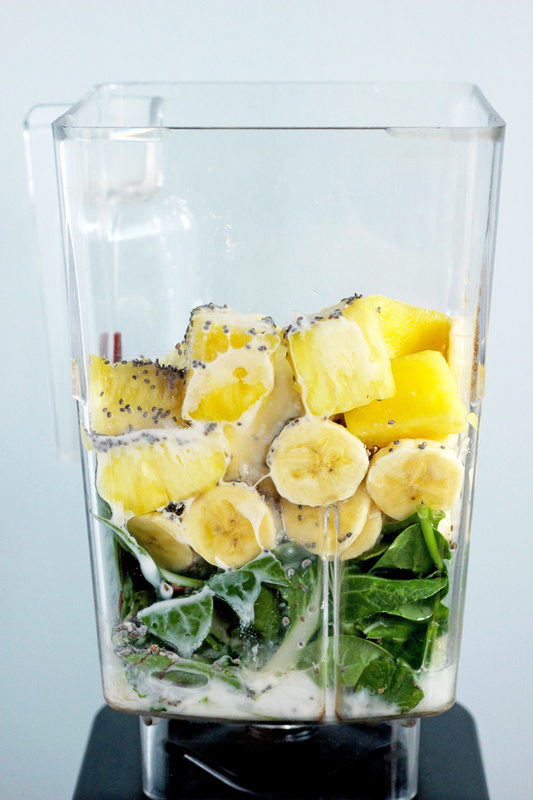 Place all ingredients into a blender and run until smooth. Add ice for desired consistency. Serve and Enjoy! Can sub almond milk and water for coconut water or other nut milks of choice. I was selected for this opportunity through my affiliation with Organic Girl and the content and opinions expressed here are all my own. Hello, the recipe says it’s fields 4 cups, are we supposed to drink all 4 cups at once or is this recipe for several days worth? Hi Alezar,1 cup is a serving so you can save the other 3 servings for later. Smoothies last up to 24 hours in the fridge. I typically drink two cups. Hope this helps. Enjoy! Hi! 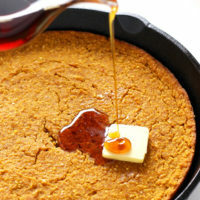 This looks so awesome, can you keep it in the fridge for a day or two? I would love to make this on a Sunday and have smoothies for a few mornings during the week, but sure if that would work though?